In the following sections, you’ll find information on clothing size conversions and tips on measuring yourself, along with multiple size charts for men, women and kids. Keep in mind that these charts are intended as a general guideline only. If you’re trying to determine your ideal clothing size, the guidelines and charts on this page should be a good starting point. Need some help with shoe sizing or measuring your feet? Check out our Shoe Sizing Guide. The size charts included here provide recommendations for both alpha and numeric sizing based on various body measurements. However, it’s important to be aware that clothing sizes can vary slightly from brand to brand. To view the size conversions for a specific product on our website, simply hover over the size selection buttons (see fig. 1). 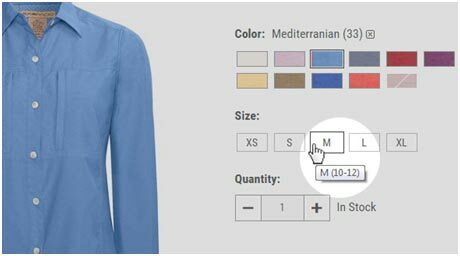 If a brand-specific size chart is available, you may view it by clicking the “Sizing” tab located on the product page (see fig. 2). For the most accurate results, use brand-specific size charts and conversions. To measure yourself at home, you’ll need a flexible measuring tape, available at most crafting and fabric stores. For measurements like sleeve length and inseam, have a friend or family member assist you. If no one is available to assist, you can measure clothing you already own instead. Choose a shirt and pair of pants that fit comfortably. Lay them on a flat surface like a kitchen table or bed, making sure all buttons and zippers are fastened before you start measuring. If none of your clothing fits well (i.e. you’ve recently lost or gained weight), it’s usually best to wait until someone can help you take your body measurements. This will ensure the most accurate sizing possible. 1. Chest/Bust: Wrap the measuring tape all the way around your upper torso, underneath your arms, until the tape overlaps. Be sure to measure the widest portion of your chest. 2. Sleeve Length: Let your arms hang down at your sides with a slight bend at the elbow. Have your assistant place the end of the tape at the center-back of the neck, at collar level. Run the tape down along the top of the shoulder and continue down the arm to the middle of the hand, about an inch or so beyond the wrist. This will allow for a little extra room in the sleeve. 3. Neck Size: Men shopping for dress shirts should measure their neck circumference. Wrap the measuring tape around the neck, just beneath the Adam’s apple. Slip a forefinger or thumb underneath the tape before taking the measurement to add a little extra room. 1. Inseam Length: The inseam is measured from the top of the inner thigh (or the base of the crotch) to the bottom of the foot. This will allow for a slight break. If you’re measuring a pair of pants you already own, measure from the crotch of the pants down the inner leg to the cuff hem. 2. Waist Size: To ensure the most accuracy, measure your bare waist. Wrap a measuring tape around your waist at the same location the waistband of your pants would normally rest. 3. Hip Size: Women should also measure the circumference of their hips in addition to their waist. Always measure around the widest part of the hips. For details on pant cut, fit and rise, check out our Pant Fit Guide. Wrap a flexible measuring tape around the circumference of your head at the same location you would normally wear a hat. This is usually about an inch above the eyebrows and just above the ears. Once the tape overlaps, pull it snug, but not too tight. Pinch the overlap point with your fingers and carefully slide the tape off your head. Round the measurement up to the nearest eighth of an inch. Check out our Hat Fit Guide for more info and a short video tutorial. Wrap a flexible measuring tape all the way around your hand until it overlaps at the middle of your palm. Always measure the widest part of your hand, excluding the thumb. This measurement is known as hand girth. First, determine whether you are petite, regular or tall. Some clothing options are available specifically for petite and tall women.
? Regular: 5'4" to 5'8"
To choose a pant size, women should measure their waist, hips and inseam. To choose a shirt size, most women should use bust as the primary measurement. It’s a good idea for tall women and women with long arms to also measure their sleeve length. Note that sleeve sizing for petite women is slightly different. If your waist falls under a smaller size conversion compared to your hips, or vise-versa, you’ll have to size up or down. For example, let’s say you have a 30-inch waist (which would be a size medium) and a 42-inch hip measurement (size large). If you don’t mind a snug fit in the thighs, consider choosing the medium. If you prefer a little more room, consider choosing the large. Of course, the cut of a garment also affects how it will fit. If you’re choosing a pair of skinny jeans, for example, you may prefer the larger of the two possible sizes. If the pants are regular fit, the smaller size may work. First, determine whether you are regular or tall. Some clothing and outerwear options are available specifically for tall men. Men's pants are sized according to waist and inseam measurements. 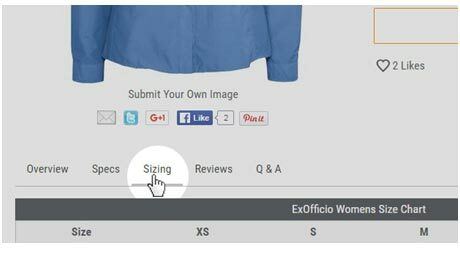 US sizes are displayed in inches. The waist measurement is always listed first, followed by the inseam. For example, a pair of pants listed as 36x34" will have a waist measurement of 36" and an inseam measurement of 34". Men’s shirts are typically sized according to chest and sleeve measurement. Dress shirts may also offer a variety of neck sizes. Note that sleeve sizing for tall men is slightly different. For most clothing brands, youth and kids share the same numerical size range, but have separate alpha sizing. Kids’ clothing typically includes numeric sizes 4 through 7. Youth clothing typically includes numeric sizes 7 through 20. Toddler sizes include 2T, 3T, 4T and 5T. Infant clothing is usually divided into four sizes: 18 months, 12 months, six months and three months. Height 33.5-35" 35.5-38" 38.5-42" 42.5-45"
Weight 26.5-28 lbs. 28.5-32 lbs. 32.5-38 lbs. 38.5-43 lbs. Height 20-23" 24-26" 27-30.5" 31-33"
Weight 6-13 lbs. 13-18 lbs. 18.5-23 lbs. 23.5-26 lbs. Men 7.5 - 8" 8.5 - 9" 9.5 - 10" 10.5 - 11"
Women 5.5 - 6" 6.5 - 7" 7.5 - 8"
Circumference 19½ - 20" 20½ - 21&frac18;" 21½ - 22&frac18;" 22¼ - 23¼"
Hats labeled as O/S (One Size Fits Most) will fit most adults and some youth. Most O/S hats are either adjustable or have a stretchable headband. O/S sizes vary slightly by manufacturer and may not fit everyone. *Note: These charts are for general reference only. Age and size ranges may vary. Shoe size conversions may vary slightly by manufacturer. Items may not be available in all sizes. Measurements in inches and centimeters refer to heel-to-toe length. Want information on measuring your feet? Check out our Shoe Sizing Guide.